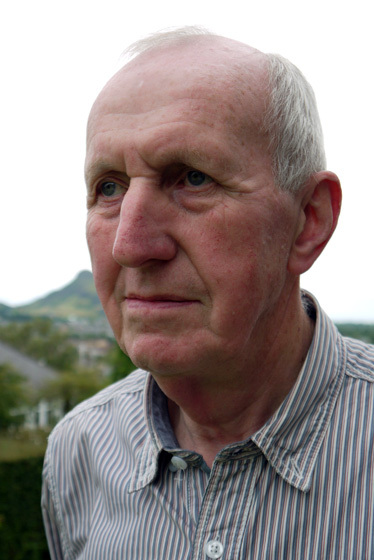 When Professor Clive Greated starts speaking about his favourite thing, he begins poetically by describing the tides, the gravitational action of celestial bodies, bulges in the surface of the water on Earth and the centrifugal force associated with the Earth and the Moon. He then goes on to mention the immense energy that comes from these flows and bulges and how the shape of the coastline also determines the strength of the tidal streams. His passion (or at least one of them) is renewable energy and particularly marine renewable energy, so it may come as no surprise that since the early 70s his home has been in Scotland, a country “uniquely endowed” with renewable resource. From the waters which surround the British Isles he believes there is no better place to experience strong currents than the Pentland Firth. Orkney, he believes, has been doubly blessed. Not only is its geographic position enviable to those who know about renewables, it has also given birth to some of the most innovative engineering surrounding that technology, much of which is conceived at Heriott Watt’s International Centre for Island Technology (ICIT). One of the most well-known names is Scotrenewables, world leaders in the development of floating tidal stream and run-of-river turbines. 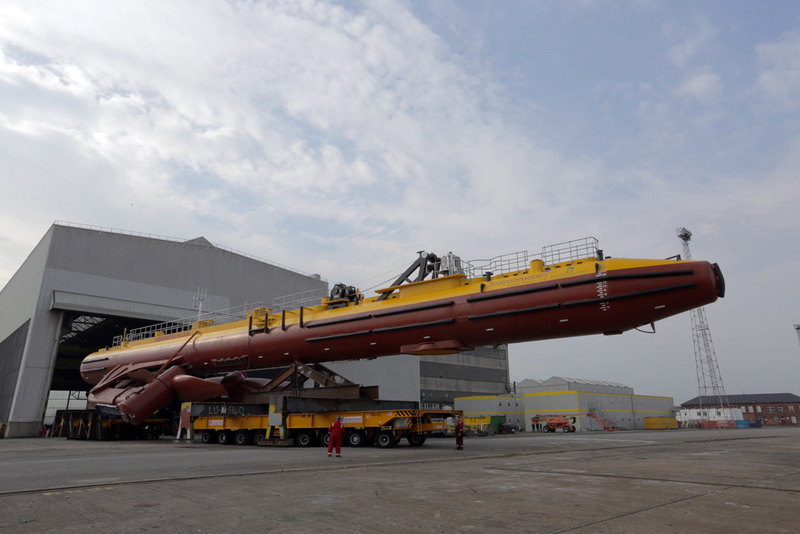 The company’s first commercial scale machine, the 2-megawatt SR2000, also the largest tidal turbine in the world, is now undergoing towing trials at the European Marine Environment Centre (EMEC) in Stromness where it will later be connected to the grid. 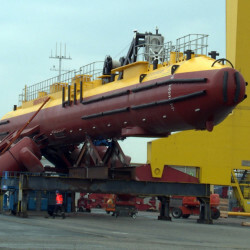 Again EMEC, an Orkney company, is the main testing site in the UK for such tidal devices. 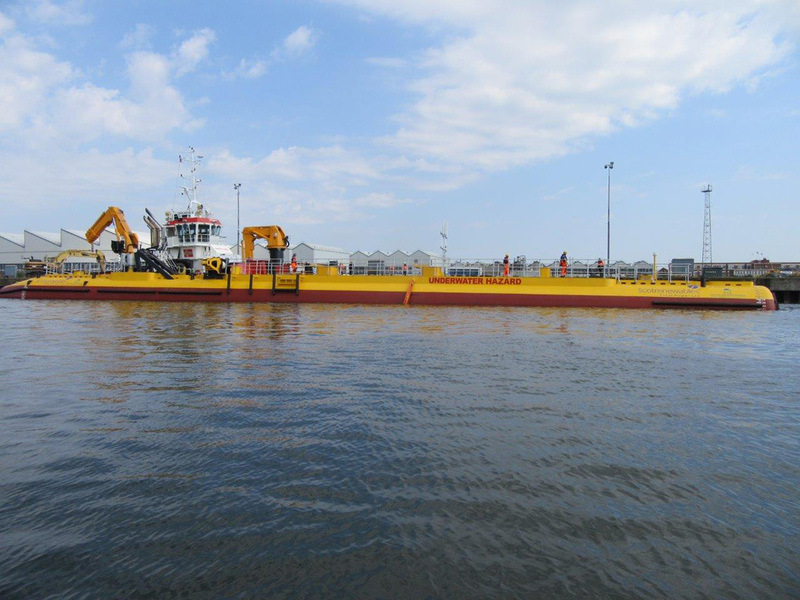 I would say that Orkney is at the cutting edge of marine renewables,” says Professor Greated. But there could be some competition in the future from China, or perhaps even collaborative work. Tidal power itself is not a new phenomenon, in fact it dates back more than 100 years to the early tidal mills which were positioned on coastal sites with an inlet. These devices were common throughout the UK mainland, but not in Orkney. Modern systems replace the waterwheel with a turbine which drives an electrical generator, producing electricity which is then fed into the grid. There is also a barrage-type system in the form of a barrier across an estuary to trap water and let it run back as the tide goes out. 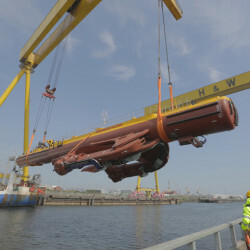 There were schemes to do this in the Severn Estuary, but they didn’t quite come off,” Professor Greated says. “Most of the modern systems going ahead now are tidal streams, taking kinetic energy out of flowing water produced by the tide. The energy that comes from this is enormous globally, hundreds of gigawatts. 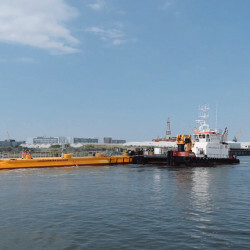 Tidal stream systems essentially operate along the same principles as a wind turbine with different models having either horizontal or vertical axis. 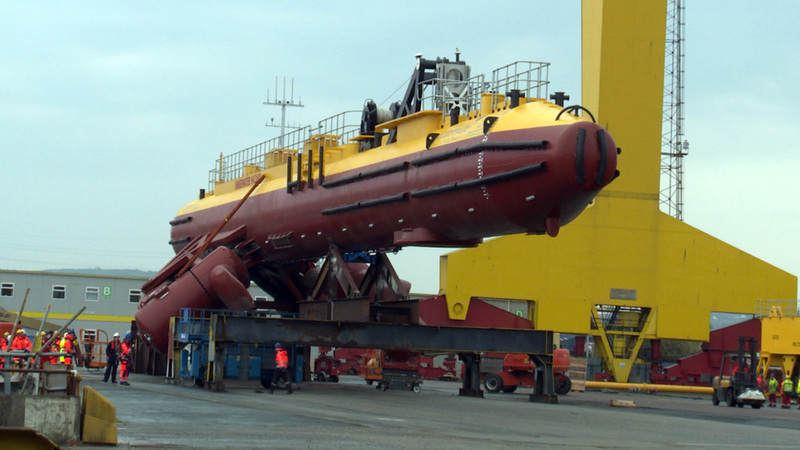 Most underwater turbines are horizontal. The amount of power produced by a turbine is proportional to the density of the fluid. In other words water is 830 times denser than air, so much more power is produced by a tidal turbine than a wind turbine. Why then are there so many wind turbines and so few tidal turbines? I think what has happened is that people have gone for the simplest thing – wind turbines. Tidal has enormous potential, but until now has been quite difficult to implement. 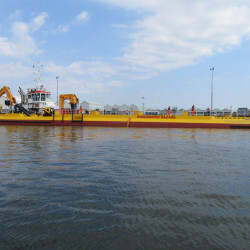 “SeaGen (a 1.2MW tidal energy converter installed in Strangford Lough in 2008) was the first grid connected commercial tidal device. 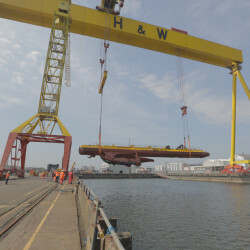 It protrudes out of the water whereas those built by Scotrenewables are floating. The turbine looks like a submarine and the blades are below water. “There are others which are fixed on the sea bed, such as those in Bluemull Sound in Shetland. 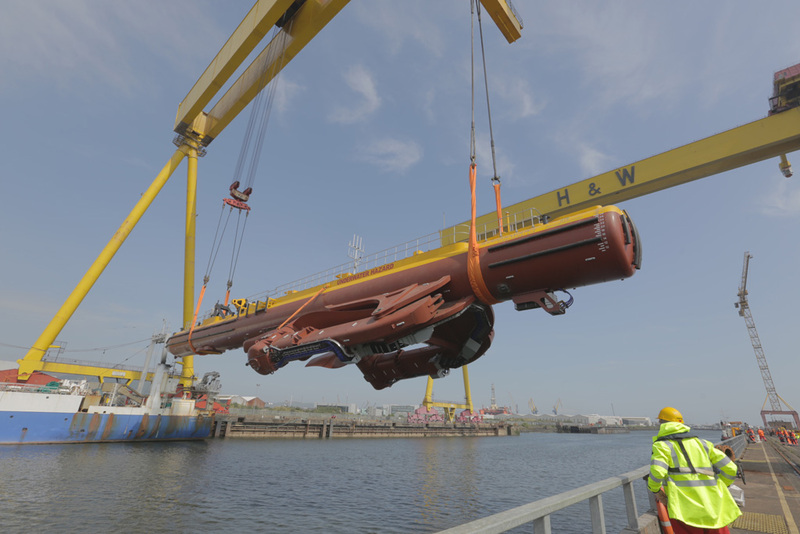 Here in Scotland, at Edinburgh University, commercial developers of tidal technologies have a unique test facility at their disposal – the FloWave Ocean Energy Research Facility. This is a large tank which can generate currents and sea states from all around Scotland. Professor Greated worked on the theory of generating waves along with his research student at the time, Professor Ian Bryden, and colleague Professor Stephen Salter, who are both now well known for their work in this area. The first FloWave tank was set up at Edinburgh University in 1972 with Professor Greated bringing many of the parts needed from Southampton. 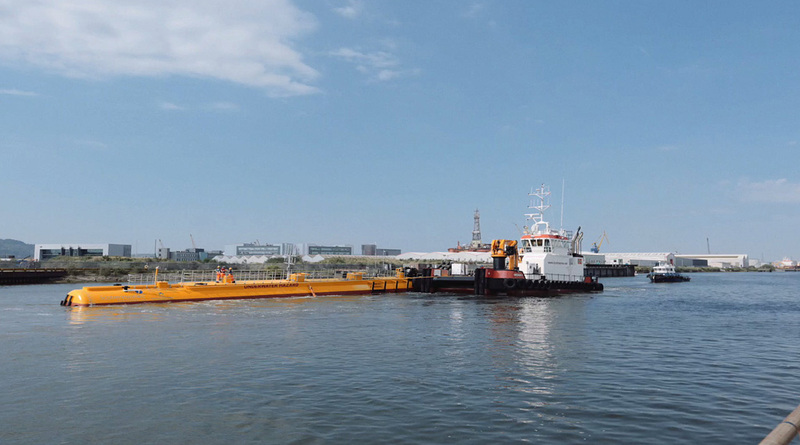 It was developed for academic research into wave and tidal current interactions but it is also an amazing tool for commercial developers to ensure their technologies and projects perform right first time. A short film made by Professor Greated about the facility has had over 800,000 hits on YouTube. Professor Greated also has a keen interest in hydro schemes. Hydro power has traditionally been very important to Scotland and recently there has been an upsurge in micro-hydro projects. These are the most flexible of all, he says. If you have a reservoir and a turbine below you can just run the water out when you need electricity. He cites the Cruachan pumped storage Scheme 19 miles east of Oban as a good example. It is one of only four pumped storage schemes in the UK. It also has the added distinction of having been used as a setting for several films, perhaps most notably the James Bond film The World is not Enough. In pumped storage, generators are used as motors to drive the reversible turbines to pump water uphill, in the case of Cruachan from Loch Awe, to the reservoir, using the relatively cheap electricity available during periods of low energy demand. This ensures the station is always ready to meet peak demand the next day. There are many positives in marine and hydro schemes, Professor Greated says. They compare extremely well to other renewable resources. This balance of putting electricity into and taking it out of the grid is a science in itself and one which he hopes will be looked at more closely to allow renewable schemes, particularly on the islands, the ability to put their excess electricity into the grid. Undoubtedly there is still a lot to achieve in the renewables field but, there has been huge progress since the 1970s. I remember going to Orkney with a colleague, Colin Anderson, who was an expert on wind power, to see the first wind turbine on Burgar Hill. Everybody thought we were mad and that it couldn’t possibly generate any useful power, but just look at the amount of power it is generating now! However, he still finds it slightly annoying that a lot of the early work done on wind power in Scotland was not taken very seriously and not sufficiently supported at the time, so that we are now in a position of buying wind turbines from other countries such as Scandinavia and Germany, when we should be making them here in Scotland. 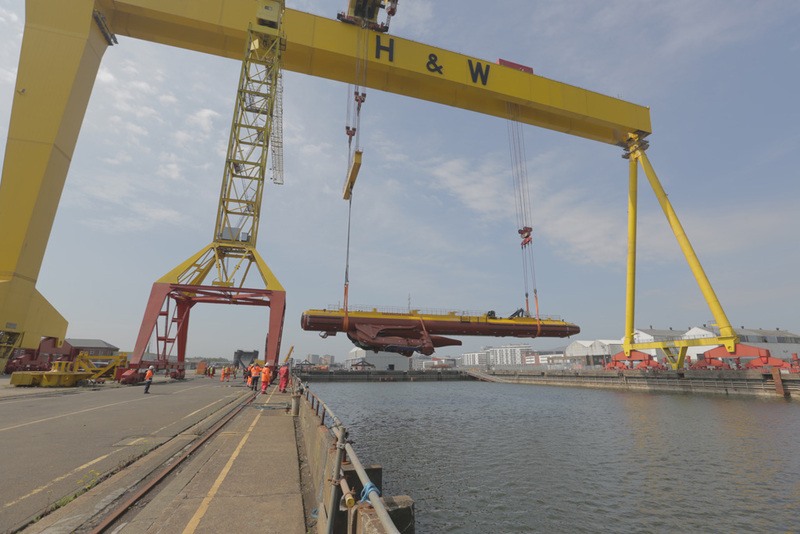 On the plus side though, the Scottish Government is very supportive of renewable technology and on the marine side and some of the equipment is being manufactured at home. 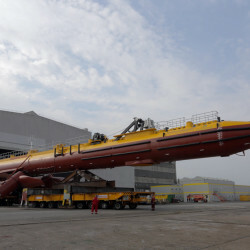 For example Shetland company Shetland Composites makes the blades for the tidal turbines in Bluemull Sound. Professor Greated’s daughter Marianne is an artist who is exploring the visual effects of renewable developments. Her exhibition of paintings entitled Coast has toured Scotland and has also been shown in Greece. Professor Greated agrees that there are people who are concerned about the visual and environmental impact of a proliferation of wind turbines. Electricity pylons are more unsightly than the turbines themselves, but the cost factor ruled out the possibility of putting the lines underground. One way to get around the complaint issue, he suggests, is to make more community-based schemes such as in Westray, where the community’s own wind turbines feed energy into the grid and the money they make is then put back into the community to fund local facilities. In this case the people have a positive reaction because they are seeing the benefit. If you are getting a share of the profits, that changes the whole feeling of it.